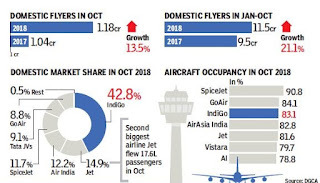 In a first for Indian airlines, IndiGo has flown more than 50 lakh domestic passengers in a month. This feat was achieved in October 2018 when the low-cost carrier had 196 aircraft and is on its way to become the first desi carrier to cross 200-mark in fleet size. Among big airlines, Air India is the only one with no planes on order and no growth path charted out. Jet’s order for new planes is mainly to replace its ageing fleet. 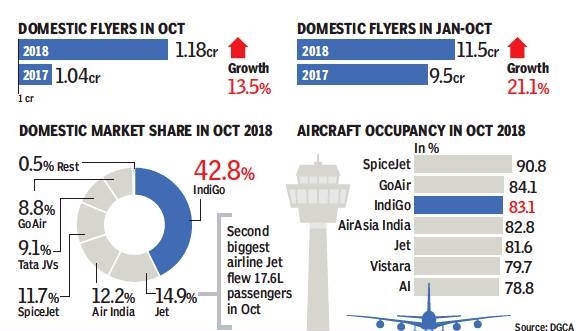 However, higher fuel prices and weaker rupee in October have forced airlines to hike spot fares, leading to a fall in aircraft occupancy.